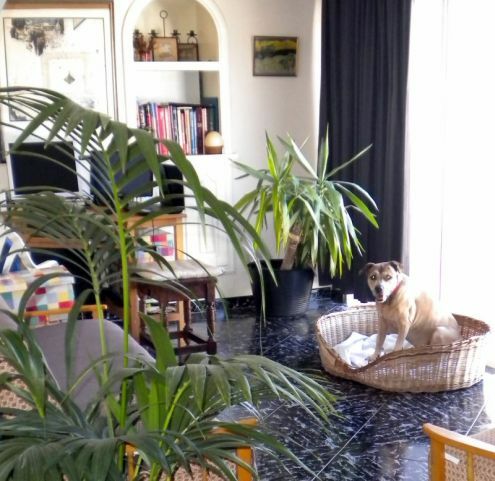 Indeed, this holiday home Tenerife was found during a vacation after less than a ten minute drive from Puerto de la Cruz. It was in the lower located suburb of Los Realejos the popular La Longuera Toscal. Toscal La Longuera or Longuera Toscal is a Spanish suburb named after its main street the long mile road with countless business. It has the most amazing open area for all sorts of shopping and services. There, not even a vet who does house visits is amiss. The apartment which we found was a penthouse which is called Ático in Spanish. 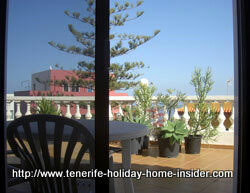 More about this penthouse holiday home Tenerife with views. This potential holiday home Tenerife is bathed in a lovely, soft light, as sun doesn't enter directly. Two large windows let us see much of a very big balcony outside. 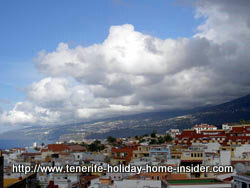 The holiday home Tenerife penthouse apartment fetched a buying offer of €125000 late in 2009 despite the recession. Those days are gone. This price has never been negotiated by its owners the Tenerife holiday home insider. Why? They don't want to sell. 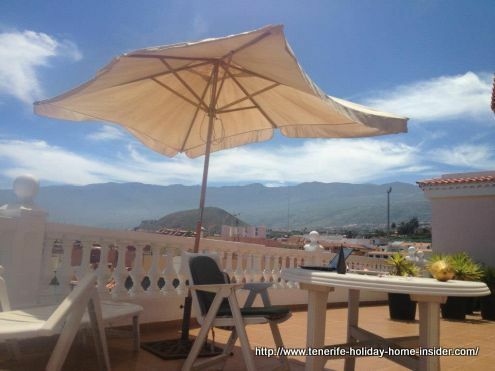 Never miss la Orotava, which is only 15 minutes by car from this holiday home Tenerife. It's the best Tenerife town to discover Spain Christmas traditions as shown here. Not to forget are the main bedroom, bathroom and fitted kitchen. All are looking out onto a patio, while an indoor yard gives good light. Peace and privacy is guarantied in this part, as well. From there it's very close to the main 'Cordilera' road to get you to the Teide Canadas. The most upper part of this highest peak of Spain may be discovered from a bedroom. You also see Teide from one side of this rooftop apartment balcony. Enjoy sun-ups over the Orotava valley and bay right by the penthouse entrance. Sometimes, fantastic La Palma sundowns are glimpsed from the same spot. Penthouse entrance with balcony door. You can't help but looking outside over the balcony when you enter the penthouse. The breath taking views usually break all ice with new visitors. 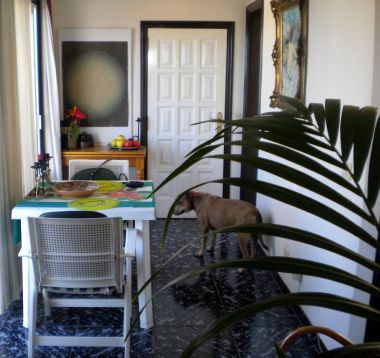 The natural lights and ventilation in this potential holiday home Tenerife are amazing. No claustrophobia there. That's the feeling you want, when inside in your holiday heaven on vacation. Admire a photo of the apartment's perfect corner computer desk from the only Ikea of Tenerife together with a few other handy Ikea products. The spacious bedroom is of course a great plus of the property dubbed Holiday home Tenerife. It has a solid wooden 2,20m wide built-in wardrobe. Its compartments are nicely and neatly laid out. Its built-in wardrobe design was done by an excellent carpenter, indeed. Admiration of this practical wardrobe inspired something similar at a Longuera apartment in Tenerife with pool in Los Realejos. Ornamental plants on balconies have often been infested in Tenerife North by the Aleuridicus dispersus Russel since 1965, contrary to the bug Leacanoideus floccissimus in the South. The holiday home Tenerife wasn't spared either. Why? Plants that were not indigenous were placed on its terrace. The white plant pest hides mainly underneath leaves,in buds, on stems, in tree tops and in soil. Whitefly organic eradication tests are done by the government ICIA with little success in all plant sectors, as many farmers use insecticides, while the latter is not recommended for balcony Whitefly control. Cut back infested plants, change the soil and give them a good showering often. Apply a bio product against plant pests. Also, this holiday home in Tenerife is conveniently close to four public bus stops. 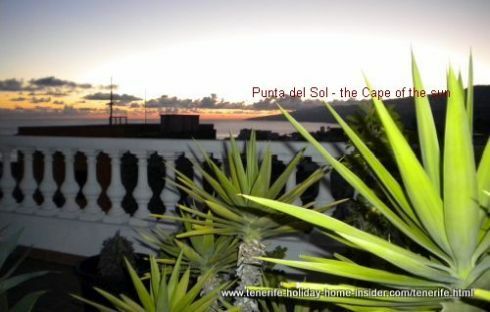 All connect with the oldest Tenerife resort Puerto Cruz, as well as Icod de los Vinos and la Orotava which includes mountain villages. You have two options to get to the South like Playa de las Americas from Icod de los Vinos. Kindly understand that showing the entire apartment is off limits for privacy reasons, unless for sale. 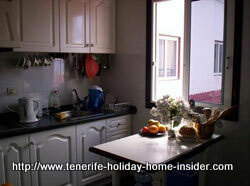 Apartments of Tenerife for long term rental, some of which are available as a holiday home in Tenerife for shorter lets. From holiday home Tenerife back to Residential property in Tenerife. Difference between penthouses in Tenerife North and Azoteas or roof gardens. Ideas for penthouses with permanent holiday home appeal.